The Last Song by Nicholas Sparks is a 'beautiful' novel. Yes, that is the word that comes to my mind to describe the story. As I flipped through the last pages of the novel my eyes glittered with tears, of sorrow and of joy and after reading the book amidst the tears, I had a satisfied smile on my face, the kind one has after reading a good book. The book will take you through a journey of all these different emotions. Sparks has this innate ability to get to the heart of relationships and bring out the complexities therein. This novel touches an aspect of parent- children relationship, girl friend - boy friend relationship, brother-sister relationship and friendship in general. The novel has also been made into a movie. In fact, it was written to be made into a movie. 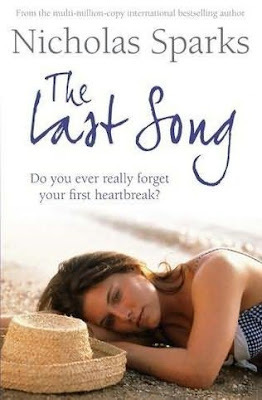 The Last Song is perhaps one of the best of Sparks' books and a must read for all who enjoys his writings. The story starts with Veronica Miller (Ronnie). She is a rebellious child who has taken the company of wrong kind of friends. It is because she has never been able to come out of her parent's divorce and have bitter feelings about it. Her life has never been the same. After her parents divorced and her father moved to North Carolina, Ronnie distanced herself from her father and gave up music. Music was the thing that she had grown up learning from her father but, now it was another source of stirring up bad memories. Three years later, on her father's request, Ronnie and her brother, Jonah are sent to North Carolina to spend the summer with their father. Resentful and rebellious, Ronnie rejects her father’s attempts to reach out to her and threatens to return to New York before the summer’s end. It is during this summer that Ronnie meets Will and Blaze and Marcus. After a disgusting episode with Marcus and Blaze, things starts changing in her life for the good. She finds herself falling for Will, opening herself up to the greatest happiness – and pain – that she has ever known. Her strained relationship with her father starts healing slowly and gradually the bond is restored, but not without taking the readers through an upheaval of emotions. The story might seem predictable but still it will move you to tears. All the characters seems real and are well defined. As Ronnie's life changes, the readers can feel the way she matures from a rebellious teenager to a young woman of substance. I loved the character of Jonah too. He is intelligent, adorable and a witty child and the way he cares for his father and sister is simply moving. Steve, too as a father does his best to spend meaningful time with his children. His unconditional love for his children, patience with Ronnie and his belief in her and finally his love for music is remarkable. The story gives an important lesson to its readers too. Forgiveness is the key to happiness. Life is too short to hold grudges against others. So, forgive and forget and move forward in life. This is the first Nicholas Spark's book I have read (but I have watched The Notebook at least a hundred times) and I loved it. Great review.